Lalu Prasad says he was able to convince VP Singh and finally the Mandal Commission report was implemented. Lalu Prasad conceived a formula to save the VP Singh regime in August 1990. After the formation of the National Front government in 1989, there was growing unease between the two power centres - Prime Minister VP Singh and his deputy Devi Lal - and as a solution Lalu Prasad Yadav advised Mr Singh to implement the Mandal Commission report, the RJD boss writes in his memoir. 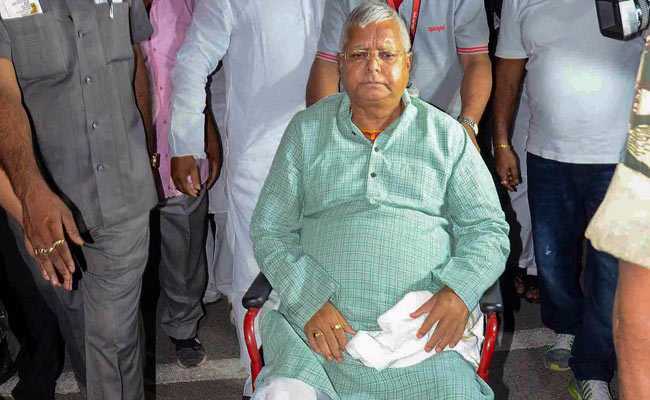 "I began to worry that the growing unease between VP Singh and Devi Lal could lead to the fall of the National Front government, and in the process could endanger my government in Bihar," he says. Mr Yadav then conceived a formula to save the VP Singh regime in August 1990. He sought an appointment with the prime minister and told him that he must take action against Lal or else his government will fall. "VP Singh had a sharp mind and good political instincts. He replied, ''Devi Lal ji is a leader of the Jats and the backwards. If I act against him, he might fan out in India, propagating that I am anti-backward and anti-poor.'' I responded, ''There is a way out. "The Mandal Commission gave its report in 1983, recommending a 27 per cent quota for the backward classes in government jobs. The recommendation is gathering dust in your office. Implement it with immediate effect''," he said. Mr Yadav was of the firm belief that, if it was done, it would take the sting out of any propaganda that Mr Lal might circulate about Mr Singh being anti-backward. Mr Singh was reluctant but Mr Yadav says he was able to convince him and finally the Mandal Commission report was implemented. "Senior leaders (who were in the ministry) such as Sharad Yadav, Ram Vilas Paswan and many others were unaware of my meeting with the prime minister. I now took them into confidence, informing the surprised leaders that VP Singh had agreed to implement the Mandal Commission report. "After I left for Bihar Bhavan, VP Singh called a meeting of the Cabinet, and it was decided to implement the report. He sent me a copy of the notification through a special messenger. I put it in my briefcase and hurriedly left for Patna," Mr Yadav writes in "Gopalganj to Raisina: My Political Journey", co-authored with Nalin Verma and published by Rupa. Among the several other topics that he touches upon in the book is his love-hate relationship with Bihar Chief Minister Nitish Kumar. Mr Yadav writes that after severing ties with the ''grand alliance'' in 2017 and joining the NDA, Mr Kumar wanted to come back to his side. He also asserts that Mr Kumar had sent his emissary Prashant Kishor to him on five occasions, a claim dismissed by the former poll analyst. "Kishor seemed to indicate that if I were to assure in writing my party''s support to the JD(U), the latter would pull out of the BJP alliance an rejoin the mahagathbandhan. Though I was not bitter with Nitish, I had lost trust in him completely," Mr Yadav writes. The book also brings out the rustic wit of the veteran politician. He says his witty disposition, skill of mimicry and earthy simplicity played a bigger role than his educational qualification in getting an admission in Miller High School in Patna. Soon after joining school, Mr Yadav says, he aspired to become a doctor but when he leant that he would have to study biology and operate upon frogs in his practical classes, he gave up the idea. He then realised that science was not his cup of tea as he did not like algebra either. "I enjoyed Arts more because it dealt with society, agriculture, politics and basic rules and laws which I could connect with," Mr Yadav writes. He also mentions how he emerged as a passionate footballer in high school and was robust, rustic and got the maximum number of yellow and red cards from the referees. "Gopalganj to Raisina Road" also talks about the arrest of veteran BJP leader LK Advani during the latter's Rath Yatra, Sonia Gandhi's decision to not lead the UPA government and Mr Yadav's acceptance of Manmohan Singh's candidature for prime ministership in 2004.